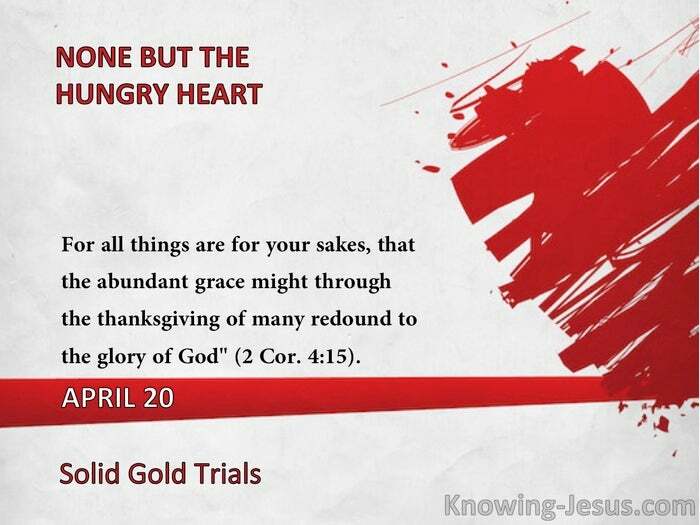 For all things are for your sakes, that the abundant grace might through the thanksgiving of many redound to the glory of God" (2 Cor. 4:15). Since He is both my God and my Father, and since all of the hardships He takes me through are specifically designed to conform me to the image of the Lord Jesus, how can I help but trust Him and rejoice in His faithfulness? "It is well to remember that the deepest and truest spiritual qualities are not learnt or established in us by our happy or enjoyable times, but in the difficult ones! There is nothing wrong in times of great joy and spiritual blessing; in fact we long for more of them, and look back perhaps to some days of much blessing in our lives or in the work of the Lord; but in the securing of Christ in greater measure in our lives, we find that it is by the things which we suffer that we learn most. So let us give thanks for the joyful days, and learn all that the Lord intends by the days of waiting and difficulty." -C.J.B.H. "Faith asks for no props from the men and things around it; it finds all its springs' in God; and hence it is that faith never shines so brightly as when all around is dark. It is when nature's horizon is overcast with the blackest clouds, that faith basks in the sunshine of the divine favor and faithfulness." -C.H.M. 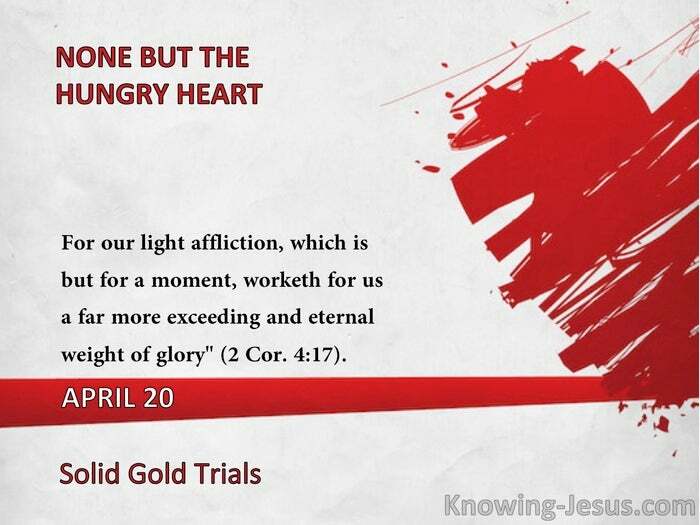 "For our light affliction, which is but for a moment, worketh for us a far more exceeding and eternal weight of glory" (2 Cor. 4:17).